LatinoPeopleMeet.com is a niche dating site dedicated to helping singles that identify as Latino, find their like-minded dream partner. With members all over the world, and an age range from eighteen to over eighty, it offers opportunities for singles to find love with someone that they otherwise may never have the chance to meet. LatinoPeopleMeet.com is a site that has been well thought through and designed with features to help you find exactly what you’re looking for in love. There’s a fun feature on the dashboard, whereby whenever you sign you’re presented with two possible matches and asked the question: “Who do you like?” You can then click on the profiles for more information if you fancy the look of either of them. If neither of them are what you’re looking for, check out the section below which shows you all the new members in your area. Alternatively, click on the Matches section from the navigation bar at the top. Here you’ll be presented with an individual photo of a member and you can then decide whether you want to click on their profile to learn more about them, or simply click through to the next one. You can broaden your search by changing the age group or location using the drop down boxes. Another useful feature is the option to turn on or off the indicator to show whether you’re available to chat. It’s once you become a paid subscriber, however, that you really get to enjoy the benefits of all the features. These include further enhanced search and match options, chat by instant message, see which members are interested in you, send and receive emails, view members videos, find out whether you are an astrological match. The sign up process on LatinoPeopleMeet.com is very straightforward. In order to become a free member all you need is to choose your preferred partner gender, location and zip code, choose a username, password, and give your date of birth and email. With that you become a member and can already explore the site. The next stage is to create a profile. One of the most important parts is to add a photo. While you can skip this for the meantime, you are reminded that profiles with photos get 10 times more attention, so it’s worth adding a good one as soon as you can. The next part covers aspects such as physical description, education, occupation, smoking and drinking habits, religion and what kind of relationship you are looking for. Handy drop down menus for each question make it quick to run through them all. There’s also an option to answer some set personality questions, select which interests you are most passionate about and choose up to four message ideas that people can answer when they send you a message. 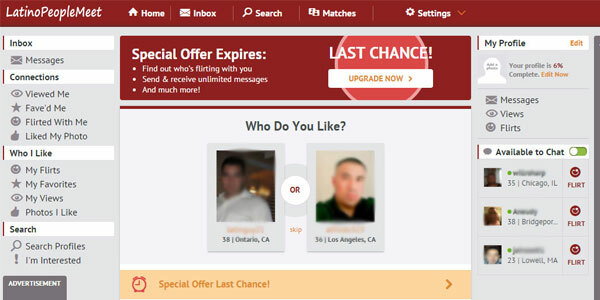 A section entitled Dating Tips which can be found in the footer of the LatinoPeopleMeet.com website provides comprehensive information on all aspects of dating safely including tips on fraud and scam awareness, practical tips both online and offline dating as well as safety tips when meeting offline. If you have any concerns about any individual members you can choose to block them or report your concern. There are three pricing plans available when you join LatinoPeopleMeet. 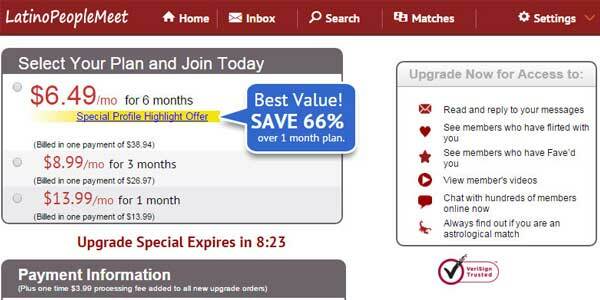 Choose from a 1 month subscription at $13.99; 3 months at $8.99 monthly or their best value 6-month plan which works out at $6.49 per month and saves 66% over the one month plan. The LatinoPeopleMeet website is designed cleverly so that you can navigate it how you prefer. You can either access all the features via the menu at the top of the page. Or use the dashboard and sidebars to the left and right to access the various sections. There’s also a handy Help section in the footer to answer all your frequently asked questions. If there's nothing there that answers your specific query, however, just click the Contact Us button to submit your question. 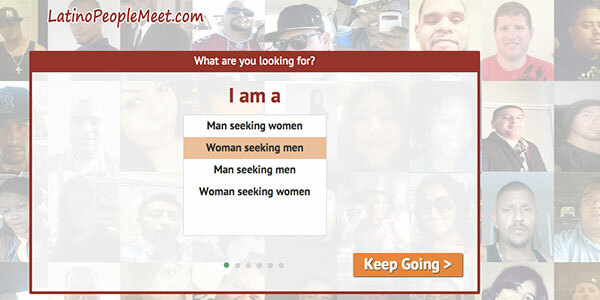 One of the best features of LatinoPeopleMeet.com is its very comprehensive search tool. You can go as wide or tight with your search as you prefer, and select from up to twelve different parameters including age, location, various physical attributes, religion and zodiac sign. With a large membership base both from the USA and worldwide, if you are Latino or specifically looking for another Latino partner, this is probably one of the best dating sites to join. If you feel that this niche dating site isn’t the right one for you, you might like to read our EliteSingles review, a great dating site for professional singles.